Flavor Text: Massive and slow and strong he seemed, dressed in all skins, with a club in his right hand and an axe in his left. This is a staple of my Lanni/Clan deck. When you combine this with things like Tyrion's Enforcers and Mountain Camp, it's a beautiful thing. 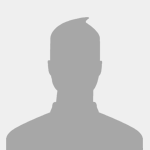 With Shagga in play can knelt clansmen be declared as defenders during MIL challenges even without a MIL icon (a la Ser Balon Swann (TWH))? Yes they can defend without the icon , it's the same case as balon swann. 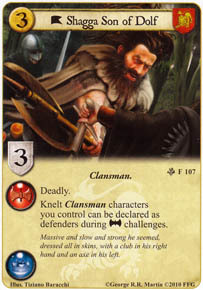 Could your knelt clansman be declared as defenders during military challenges for an opponent in a melee game, even if you don't support them? I don't believe so. To defend a challenge you normally have to meet 2 requirements. One is having characters with the proper icons standing that can defend (which this allows you to bypass) and two is being the target (or having a special rule, like supporting titles that lets you defend even if you're not the target) and this doesn't say anything about letting you defend if you're not the target. However, I could be wrong, you might consider asking this in new player questions.